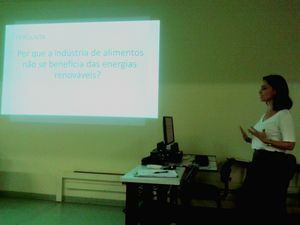 Photo: Maria Elisabete Haase-Möllmann, Key question of Ana Sobreiro' academic work, applied to fish processing: "Why the food industry does not benefit from renewable energies?" The professional consultant in Food Engineering, Ana Azevedo Sobreiro de Campos, participated in the 3rd Workshop of the Rosoma Project in June 27, 2018 at TECNOPUC, Porto Alegre. "At that day, I got inpiration to write about sustainability in the fish processing industry and why, in general, food processing does not benefit from renewable energy sources." explains Ms. Sobreiro. At that time, she was enrolled at PUCRS as student of the course on Renewable Energies, one of many graduate courses at specialization level. "Now, I am happy that the academic work is succesfully concluded, with a very high grade", she completes. 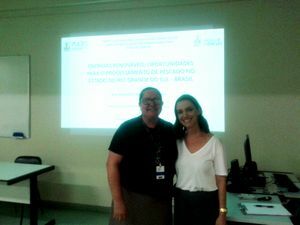 After almost six months, Sobreiro, under the supervision of prof. Dr. Jeane Estela Ayres de Lima, had the public defense of the academic conclusion work entitled “Renewable energies: opportunities for the fish processing in Rio Grande do Sul Brazil”. After discussion with the examinators, Lima pointed out that "It became evident that there is a potential for the use of renewable energies for the fish processing in our state. For the time being, there is not any noticeable use of biodiesel or biogas out of the residues, as Sobreiro verified in her work." Dr. Marcus Seferin, technical coordinator of the Rosoma project at PUCRS, stresses that "Use of residues for energy generation incorporates high sustainability goals in the processing of fish and seafood. Ana Sobreiro was able to show ways to perform it and how is the actual situation, focused on the fish processing in our state. Energy for the automation can be generated from the processing itself. We are going to actively disseminate the results through the fish production chain." Seferin provided literature and exchange of ideas for the academic work. Copy of the conclusion work will be available after corrections and disclosure in this site.